A very weak boy finds a sword (actually, it is the other way around) which gives him physical strength and ways for vengeance. If this sounds like Elric books by Michael Moorcock, it is because I had exactly this impression. The similarity soon ends; the rest of the book is distinctively Glen Cook: bleak, gritty, full of betrayals and double-crossings. I am a big fan of Glen Cook, but this is probably his weakest book I read. It is not bad by any means, but everything else by the author is better. If you are interested in his works, read Chronicles of the Black Company, Garrett, P.I, The Tower of Fear, or even Dread Empire series first. It's a shame Glen Cook has never continued this tale; the ending unarguably leaves room for a follow-up and we as readers can only hope Glen returns to this particular world of his creation one day. "The Swordbearer" is a deftly-written, action-packed high fantasy tragedy with a truly compelling and sympathetic lead character and a host of memorable side personalities. A young boy's idealistic dream of becoming a warrior is thrust upon him all too suddenly and violently in a manner that not only demands he grow up whether he likes it or not but own up to those demons most dark and personal as his goddess-determined fate forces him to become the wielder of a blade that incorporates the souls and memories of those he slays into his own consciousness.The promise of character development through personal tragedy and global disillusionment inherent in a tale of this magnitude is taken full advantage of by Mr. Cook who manages to add a heaping dose of political double-talk, intrigue and personal betrayal into the mix along with his penchant for a full serving of crackling, perfectly-scored swords-and-sorcery action; no one quite writes action with the rhythm, timbre or intensity of Cook. If you love Glen's work, you shouldn't miss this particular stand-alone read. The worst thing that can be said about it would be that the author has never explored further into the world of our hero Gathrid and his dwarf companion Theis Rogala. I truly hope Cook decides to return to this particular miniature saga in the future; it would be a tremendous character study well worth further pursuit. Violent, dark, nearly hopeless and yet strangely uplifting, this book is entirely in Glen Cook's style. Yes, even though I've only read two (this one included), I'm quite sure it's his style. Epic battles, casual destruction of human life and human works, all seemingly pointless and yet a point is found somewhere in all that carnage.A weak, nearly crippled kid sees his home kingdom destroyed by a superior enemy force. They appear the epitome of evil at first, and he vows revenge, though at first all he needs is to survive. He flees, and in a cavern finds a sword and a strange dwarven companion. The sword gives him power, the dwarf - hard, blunt advice for a harsh world where naive idealism has no place. And the boy finds himself enslaved to this strange sword and its insatiable power for destruction, a power he cannot at all control. And as in any other Glen Cook novel (I'm sure) things aren't very simple. Evil is not quite evil, good is not quite good and the whole world often appears little more than someone's feverish dream.As far as I know there are no real sequels to this one. I'll keep looking, because the end is surprisingly open and unsatisfying. When you read this one, keep a full weekend open: you will not be able to put it down until the wee hours. I definitely could not. From the first pages this book reminds me of Elric tales by Moorcock. Mainly because of the sword Daubendiek and eternal game of Ancient Old Ones. Story is captivating, there are no dull places in it. I read it in one breathe. Book exploits my favourite themes of free will and conscious, though not in a serious-minded manner. But this is fantasy, not some philosophical work, so no wonder). Plot holds some mysteries from the very beginning and many of them unfolds at the end. Book could become good start for nice series of stories about Swordbearer. But sometimes it's better to leave story without sequels, I guess. Mood is dark, grim and sad at the end. In my opinion this story is good example of dark fantasy and sword and sorcery genre, recommended for every fan. The story itself is amazingly captivating. It played the strings of my imagination in a very dark, off-time way. Having said that, I wish the book was written with a little more clarity. It can get confusing at times. Especially with the dialogues and names. But don't let that stall you from reading it till the end. Would have given it 5 stars, had it been written better.Peace!! The Endless Game?Elements of stories you've read and enjoyed mixed together in a different pattern. Not quite the old stuff but not quite something new. Entertaining in any event. Having recently purchased the audiobook from Audible, I felt the need to return to and review this quick and entertaining read. I’ll begin by briefly addressing my one negative point. In this book, more so than in any other of Cook's that I've read, the possibility of being overwhelmed by a flood of names is deeply present. Take, for example, the following excerpt from the first few pages of the novel:"[They] lived in a small fortress called Kacalief. Their father was Safire, or knight protector. The Dolvin's Savard March, guarding the kingdom of Gudermuth's easternmost frontier, had been in dispute between the Kings of Gudermuth and Grevening for decades. The Sheriff of Rigdon, a town on the Grevening side of the border, had a habit of sending small bands of bravos over to cause trouble. "That is quite possibly the worst single paragraph in the text; when he wants to, Cook can make George R.R. Martin's penchant for complex family trees look like a mild fascination. Fortunately, the majority of the novel that follows is free of this kind of grating parade of titles.After that somewhat rough opening, the narrative really starts to shine. The novel is a coming of age story that focuses on themes of masculinity and addiction, painted against a backdrop of fantasy warfare and millennia-old divine grudges. As with several of his other works, Cook addresses masculinity's relationship with violence through the engrossing lens of aggressive female characters, in this case by way of the central antagonist Nevenka Nieroda. Nevenka’s entire identity—but in particular her gender—is a convoluted point of engagement for the reader, becoming an obsessive fascination of our adolescent protagonist. Cook's simultaneous gendering and de-gendering of violence calls into question its relationship with masculinity, making his oft-praised point that war is in the business of killing men rather than forging them. While this message is perhaps not as effectively conveyed as in some of his other works, such as his most successful release, 'The Black Company' series, it is certainly more affectively conveyed. Through the lens of our teenage protagonist, the emotional punch of this novel is a bit more potent than the cynical, distant accounts of Cook's more prominent works. It reads less like the ‘The Things They Carried’ and more like a well-constructed YA novel.Beyond his character-driven plot, Cook continues his trend of using selective description to draw the reader into a fantasy world that both feels lived-in and produces wonder in the reader. Forgoing the extensive appendices so often found in today’s fantasy novels, Cook’s use of a limited third-person perspective allows us to walk around in the world he’s invented, stumbling upon its wonders and quirks just as our protagonist does. It all contributes to the novel’s large sense of scale in a compact page count.As a coming-of-age novel that lies somewhere between the graphic fantastical extremes of C.S. Lewis and George R.R. Martin, it hits all the right notes and does its job well. Moreover, it does so with a sub-300 page count. If you're looking for a quick read with a compact and potent sense of philosophy and atmosphere, give this one a shot. This is dark fantasy at it's core. No doubt about it. There is no hero, per se. There are goals and objectives and our main character will do anything to achieve it. Excelent!But some things are just too damn confusing. Sometimes I can't really figure it out who is talking or why they are saying the things they are saying. It's a confusing tale.The Swordbearer begins with giving us a lesson in history, geography and mythology which is nice but if I hadn't a book where I write the characters names and places and special events I would be at loss. Almost no descriptions, a crude writing language (probably on purpose) but it confuse me. And the names of places and characters? Most of them are pure gibberish.On the other end of the spec you've got a bleak, gritty, betrayals and almost near suffocating book. Glen Cook is a odd duck. In one side you've got a great dark fantasy story but in the other you don't involve too much because most of the book alianates you with his characters and names and narration.The Sword and the Boy reminds me of Elric but that's where the similiraties end. Don't forget this book was written 30 years ago. Most of the fantasy you read noawadays didn't exist - Sven Erikson, Robert Jordan, George RR Martin and others"You want to stay alive, Sword or no, you'd better learn this lesson. You get your enemies, any way you can. Fight Fair, play the brave chevalier, and your're going to get your gut spilled. ""-You fight fire with fire in this world. You don't see these Ventimiglians counting scruples do you- If you sink to their level, we're no better than they are. -What gives you idea that you are? Human is human boy...""Theis, no. I couldn't. -What? "-Kill men while they're sleeping. "-Best time. They don't fight back. You remember who they are? They could be the men who tortured your mother. Aren't you hungry? They have more than horses. Boy your age usually eats a ton of fodder a day.Gathrid needed no reminder .His navel was griding against his backbone. But to kill men over something to eat...He was not that hungry.Not yet." The further along I read in this book, the more I disliked it. Thankfully, it contained only 250 pages.There is this teen boy who wants to be a warrior, but because of infirmities suffered from polio ( yes, even in the mystical fantasy world concocted in the book, there was this very specific disease) is belittled and scorned. Cliche # 1However, danger threatens. An ancient enemy approaches, an army of awakened dead with horrible black magic (Cliche #2)destroys all in its path, including the boy's home. Fleeing the slaughter and chased by a black- robed demon, he falls into a cave where he discovers a sleeping dwarf who is the guard of a magic sword. Cliche #3A sword so powerful it makes a heroic, Arnold Swartenegger gladiator out of the weak teen. But there is a price, of course: the sword is sentient and thirsts for blood. In fact- or fantasy, that is, blood of enemies creases the sword's power over who wields it. # 4 and 5And blah, blah on for the next 200 pages. Treachery, dragon- things, blather, adamsel in danger of sacrifice, combat, blather, wandering the countryside.Rinse, lather, repeat. Not a cliche is missed. What was missed was any depth of character development. I am not sure if the book was meant for the YA audience or not, but it sure was not meant for this reader. Why should I read this?Such a short read(everything is speed-up as to focus on choices and personal conflict), with such a solid topic(the unveiling hero with no control on his destiny) but with such a Glen-ian/erikson-ian ageless backstory.What else is this book about/Any other way describing the plot in a technical non spoiler way?One might say is a deconstruction of the teen-adult dream to become a hero. Perfect I could not ask from more from a book...Any 1 warning? (not to be taken as criticism)Although it looks like it’s one of his first, or before he got famous, or before he mastered the pen for the Black company series, or written in a rush, I think the style (fast skimming through the plot progression, and the political subplots, and the third personarson event depicting) is perfect as to focus on the anguish of being a hero not in control of his own fate and also giving depth, and context to his motivation&action. Great novel. I've said it before, but you can really see how Glen Cook has some themes that he likes and revisits in many of his novels. There are many character parallels between this book and the Black Company series. The Toal and the Taken are very similar. Nieroda and The Lady, also very similar. Really, this was a very well-written, full story. Obviously, since its a Glen Cook novel, there are long drawn-out battle descriptions, but they're more clearly written than they were in the Dread Empire series. There seems to be a open road to a second novel, and I wonder why he didn't pursue it. I'm guessing it's because he took so many elements from this novel into The Black Company. I really enjoyed it and surprisingly enjoyed the ending - an area that seems to continuously be Cook's weak point. This novel has a polish to it. The beginning was very fast paced almost to much so. The second half was much more interesting and exciting and I liked the reveal of certain forces at the end of the book but also there where things still left unsaid at the end of the book. and I don't know if I can trust the ending because I don't trust some of the characters to stick with the promises/remarks/decisions they make at the ending of this book. This book wasn't as good as some of glen cooks other works but that is okay. It was better than some other books I have read. I am a bit Luke warm about this book but it wasn't awful and I do really like glen cook as an author that hasn't changed. I went into this with lower expectations so I wasn't disappointed. This is early Glen Cook. He has some habits - a lot of explication barely broken up by action - that he controls well in the Black Company series but that is left to wander his grim landscapes here. The story is good. The book would be 1000 pages if he trusted the reader back then to infer from scenes what is instead explained explicitly. 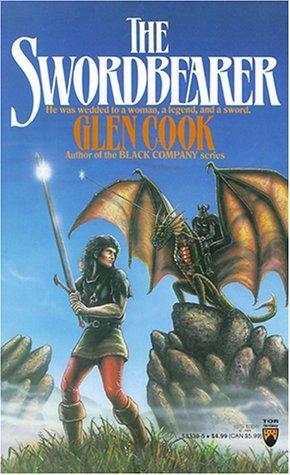 In short, I think if you like Black Company, you'll have a hard time with the writing here but if you liked the Instrumentalities series, this is more in that style.For me, this was the first Glen Cook book I read. I loved it then, in 1988, and I have nostalgia for it now. I like to see how the worlds interplay. But the explication is a distraction. Before we even get started we must address the elephant in the--err, on the cover. Ignore the hideous cover, clear it from your mind. Don't look at it!Now, the book itself is a stand-alone. It tells the story of a young man with a disability and his family who live dangerously close to a border about to be invaded. It contains Cook's trademark undead sorcerers, buried relics with magic powers, and gritty dialogue. While not up to the level of later works, this book is a solid and fun fantasy adventure story that can be read in a few hours. Recommended for fans of Cook and S&S fans in general. Sword and Sorcery Unlike many stories of this genre this book does not go on and on and on with more sub plots the stars in the sky. It stays to the point and with the main hero of the story. Then wraps it up in one book not 3 or 5 or open ended. It COULD have a sequel but it does not need one to comply the story. Personally I like an ending like this that died not spell out everything but let's the reader decide if it is the end our just the beginning of a new adventurer. Very good book, although much more could have been done with the premise. The biggest flaw with this book is that it is just simply too short, everything just concludes too quickly. As soon as you really get into it, the book ties everything up and calls it a day. Great if you want a short book to get into the swing of Glen Cook or general good fantasy books. Glen Cooks worst work, I dont recommend it, I knew it going in, but in general he's great, and i'm a completionist so I had to finish this. But, save this until you have read every, single, other, book by Cook and want to see some of his less-polished material. Or just skip it and pick up something better by someone else, perhaps Richard K Morgan or Brent Weeks if you want gritty fantasy. I picked this book up at a used book fair purely on the good name of Glen Cook. This book did not disappoint! Though the novel is short, I enjoyed Gathrid's growth and the world building that Cook did in slightly less epic fashion. Even though the story does not contain the breadth or depth of the Black Company books it is still an epic fantasy. Thoroughly enjoyable! This has to be one of my favorite all time Fantasy novels! I love this story. I wish it werea movie. It has a very intricate lot with lots of shades of gray, not so black and whiteas it may seem in the first few chapters. This is great fantasy that doesn't get ahead of itself. Glen Cook keeps the reader in check every step of the way as you follow the path of Gathrid The Swordbearer, his allies, and his enemies to the end. A fun read. It was good, not the best Cook but good. I enjoyed the ending. The action got bogged down by politics, which I did not enjoy, but overall a good read for any Cook fan. If you are not familiar with the author and want to know what to read, skip this one and read The Black Company. Jam packed but not necessarily in a good way. Some interesting elements, but overall I felt like there was so much going on it detracted from the overall story. You never really got a chance to know anybody. Pretty grim.I felt like the prose style was inconsistent, but I still found the story very compelling and ultimately very satisfying. An interesting and fun read, but not as much fun as the Black Company or most of his other series-work. Good stand alone fantasy by Cook. An early woork by Glen Cook. Not nearly as good as much of his later work.